They didn’t want to spoil the head because they were going to cook it, so they were very careful where they hit it [a halibut]. / Yeah, right here in the nostrils. That stunned it and then you turned it over so the belly side was up and then it didn’t fight as much. If you leave it belly side down then it bangs the boat a lot. Halibut fishermen used wooden clubs to kill or stun their catch; otherwise a heavy, struggling fish might turn over the canoe. 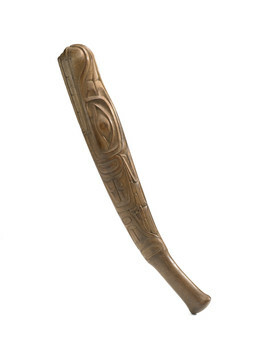 The clubs were often beautifully carved, like this one which bears the image of a sea otter. Halibut remains a subsistence staple in many coastal communities.